Well -- It's all rather confusing, really. and prior to 1959 it was always PCM.
" -- PCM equipment can held in mid-step, at any 'tick', by moving the handle back to Shunt (or Inch on very old stock) to control the rate of acceleration.--"
To my understanding (based on 1955 built, MetroVic controlled Helsinki trams driver's manual and young kids general observation of trams) staying on an intermediate notch is not a good plan, as resistors may overheat. Thus it seems odd that the controls allow (allowed) this. Yes, I do understand (i.e. I do NOT know this for a fact!) that the inch/shunt is a series notch with all resistors in use.
" --One thing to note, some stock, including the 67, 72 and C stock use 2 RPAs, one for winding up to series, and the other for winding up to parallel. Other stocks only use 1 RPA. I'm not sure whether the 73s use 1 or 2, but I'm sure someone on here WILL know--"
So which classes used single camshaft and which used two separate (series and parallel) camshafts in PCM/RPAs? Is the RS Info Sheets 4 Edition.pdf in the wrong when it says that 1972 stock has single camshaft PCM/RPAs? No intermediate notches between inch/shunt and series or series and parallel in Controller. Ever during MU resistor control? When did "Inch" notch became "Shunt"?
" -- The unusual feature is that once the driver has moved the controller to 'full parallel' and the train has accelerated to the point where the switchgear is actually in full parallel, the driver can then move the master controller back to 'full series'. 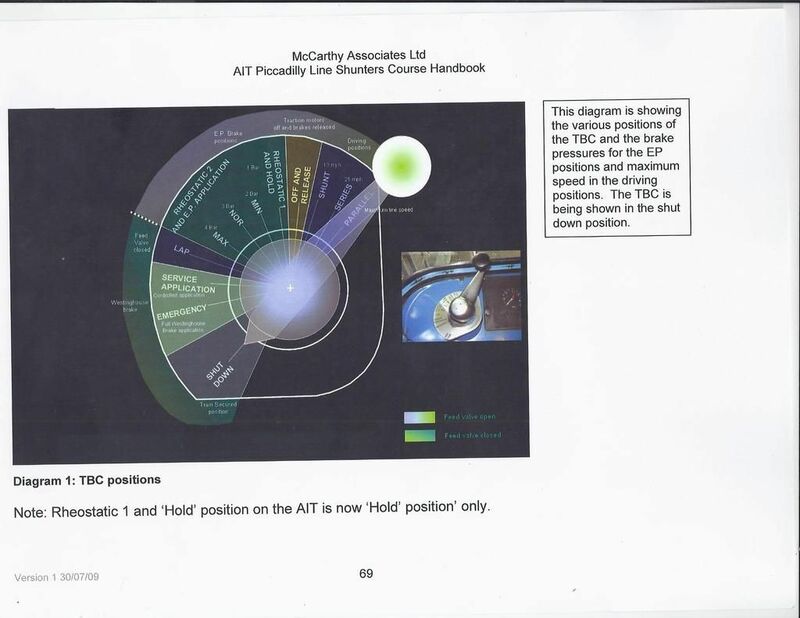 The traction switchgear will remain in 'full parallel' unless the driver moves the master controller from 'full series' to any position towards 'off'. Many drivers took advantage of this feature because it was more comfortable maintaining the downward pressure on the deadman's handle with the handle at the 6 o'clock position (the 'full series' position) rather than the 9 o'clock position (the 'full parallel' position). --"
Was the 1938 stock the only class that had the PCM/RPAs not able to reverse under load? Ever? The Line breaker will blow at "Off and release". This is now a fact, no? So, there has been variations in the number and meaning of brake notches from class to class. In C (and 1972 etc) stock was the rheostatic brake action the same at EP brake nothes min, med and max? Does the rheostatic brake use "line" to supply for motor field and no batteries? In case of line failure the rheostatic brakes will drop, no? 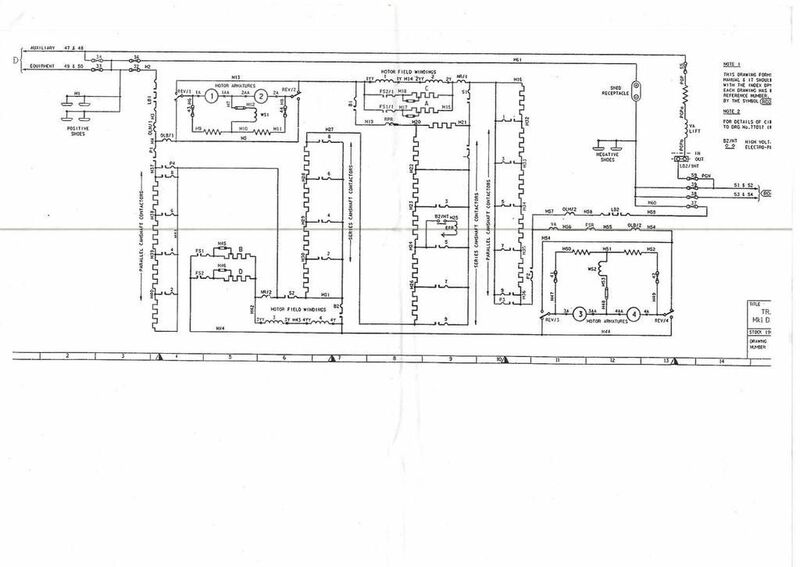 The "Diagrams, Instructions and Other Scans" area here is a well of information. There seems to be all sort of drawings of stations and rolling stock (suitable for modeller) but very few schematics for someone trying to understand what actually happens... And sadly so many links to actual data has rotted... Unfortunately I have not come across electrical schematics of power control that would show the controllers and the PCM/RPAs of resistor controlled trains. Are there any public schematics anywhere? Can someone point the correct direction to find them? Yes I'm aware of that. On the D type EP release on EP also is also release, running and charging the Westinghouse. Same on BR Southern Region EP stock. I thought I was clear with the A type EP brake, motorman puts handle to EP application, then returns it to EP lap to hold that pressure. 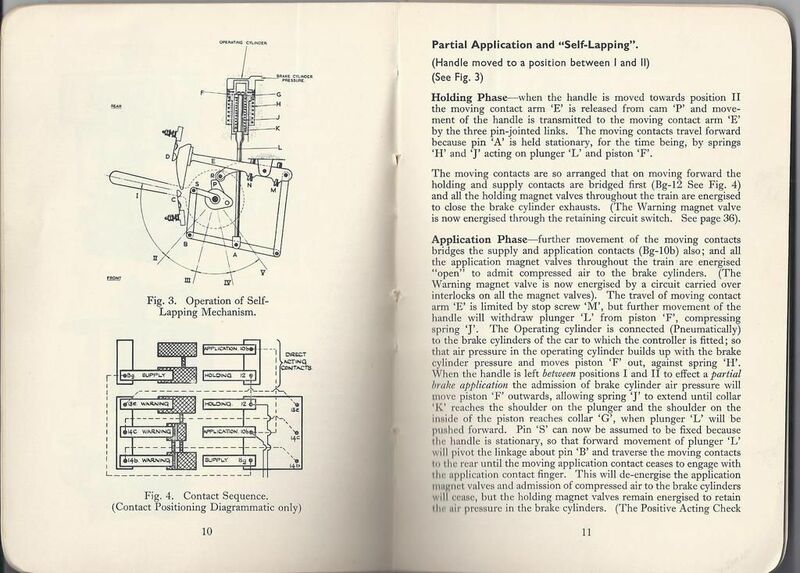 Westinghouse lap was further round than the EP application position. 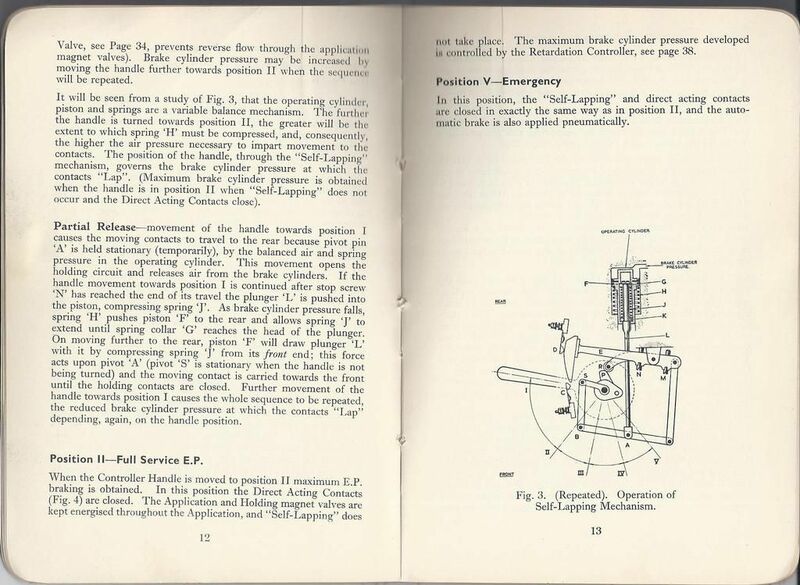 One problem with using Westinghouse only on Underground stock was that if the EP was isolated for some reason you only got about 28psi in the brake cylinders as the mercury arc retarders were switched out as well. Somewhere in my book collection I have THE book on the RPA/PCM equipment which somebody at Waterloo lent me many years ago. If ever I find the book I'll have a look through it and see what it says. But yes, it was possible to run up to parallel and hold parallel by putting the controller back to series for drive comfort on the older stock. Personally I found the C69 unconfortable to drive, maybe because it was rather alien having to drive left-handed! Luckily I didn't do that very often. On the older SR stock the same applied with the deadman/controller, run up to parallel/weak field, handle back to series for comfort! On the later BEP/CEP/CIG etc stock they had different master controllers with full weak field back towards the driver. 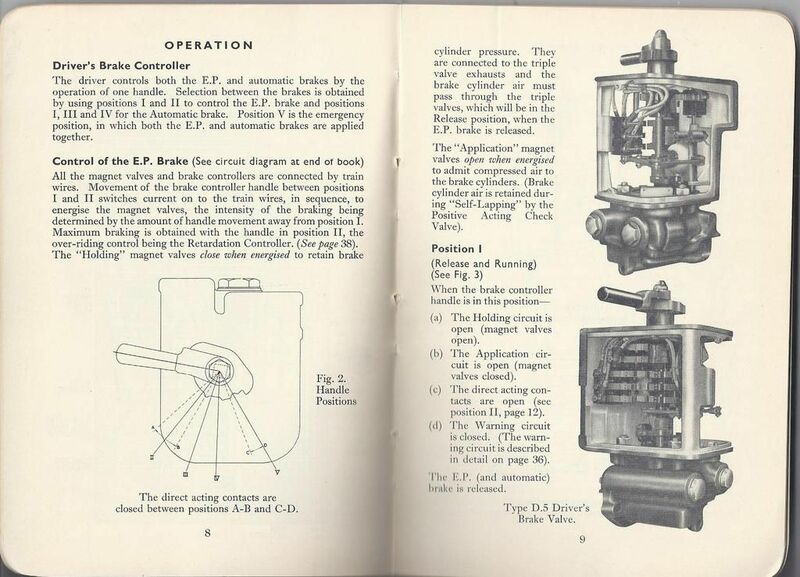 EP brake could be simply switched off and as there were no mercury retarders, Westinghouse gave the full 65psi in the brake cylinders. But, we only had 3 applications of the Westinghouse before the auxiliary reservoirs ran out of air! Somewhere in my book collection I have THE book on the RPA/PCM equipment which somebody at Waterloo lent me many years ago. If ever I find the book I'll have a look through it and see what it says. fish7373 and Roythebus: thanks for the explanation and prints of the brakes. The EP brake handle is really a mechanical marvel combining handle position and brake pressure into electrical contacts. I'm impressed! Dstock7080's: The Image of the notches just wetted apertite but alas gave very little.
" -- Another thing about the RPA it notches up to its fullest position in Series and then notches back to its rest position to reach Parallel. It's then ready for Rheo braking.--"
or am I completely lost? Do you possibly have the other Fig 5 images as well (the 5-viii figure mentioned that the Fig. 5-x should be the motor and resistor side of the circuit). 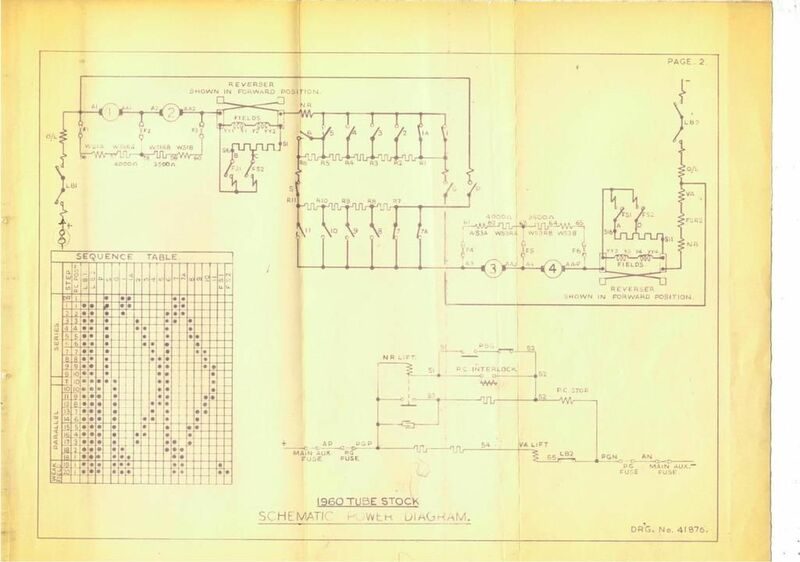 I found Q stock control schematic links from "Q STOCK CONTROL CIRCUIT". 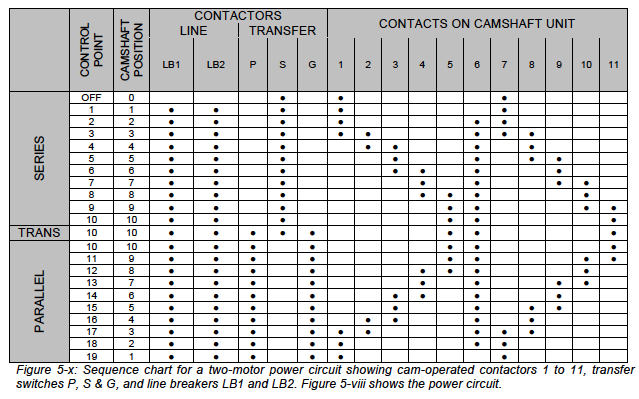 No camshafts there, the schematic only shows the resistor contactor's coil side or controller side, right? Dstock7080: I must have long wires and dim light in the attic. Last night the lamp got light: I realised why the resistor contacts on camshaft unit did not form a triangle but a ramp. It is the idea of controlling the resistors by "sort-of-tapping" instead of "sort-of-shunting"
BUT: How it is done in case one has separate series and parallel camshafts, like in 1972 stock, not to mention Rheostatic braking? Have you (or anybody?) 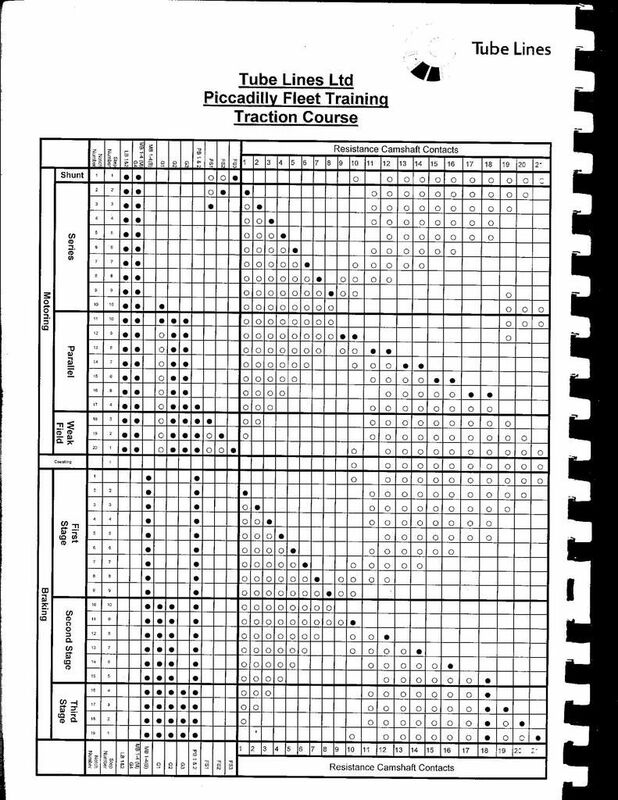 got both a"Sequence Chart" and a "Power Circuit" of Single and Double Camschaft system that has rheostatic braking as well? This way I could hopefully(!) understand what is happening during acceleration, transition and rheostatic braking. I have Pierce Connor's "The London Underground Electric Train", but it does not give all the answers. If you don't get a reply in a few days time, I will get some drawings for you.
" -- pairs of motors were wired together in series, and the controller switched between all four motors operating in series, and the two pairs operating in parallel. In order to protect against wheel-spin, the contoller automatically reset if one motor of a pair began to run faster than the other --". It is the Double camschaft w. Rheostatic brakes (1967, 1972 or D69/77 stock) that I'm most intersted in!